Jeffrey Locke, a teacher from Satanta, stands to argue for his motion to add support for the death penalty to the Kansas Republican Party platform. Support for capital punishment had been in the Kansas Republican Party platform as recently as 2012. The party left it out of the platform at its last convention in 2014, without voting on the specific issue. Jeffrey Locke, a teacher from Satanta, led the charge to return the issue to the platform on Saturday, saying it would honor the victims of crime. “The victims deserve to have a voice and they’ve been silenced,” Locke said. At the convention, supporters and opponents of the death penalty both said religion was on their side. But opponents also cited the costly appeals process that makes it more expensive for the state to execute perpetrators than imprison them for life. 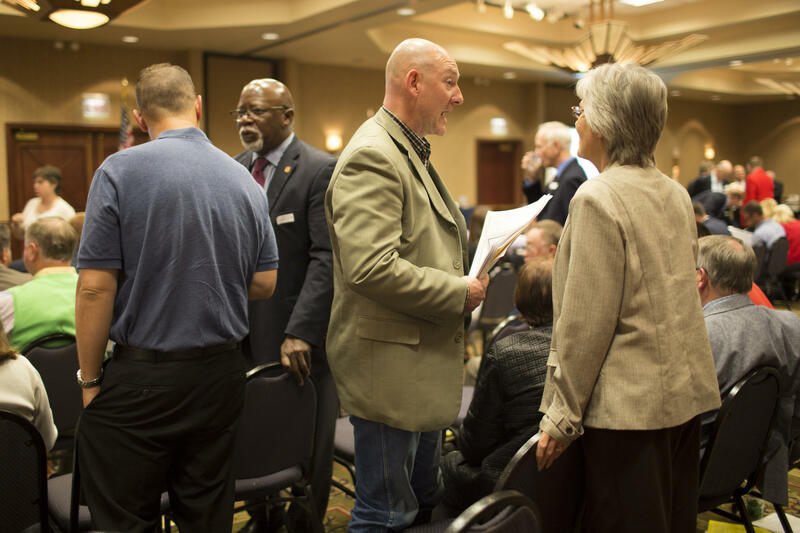 Eliehue Brunson, the head of the Kansas Black Republican Council, said his 37 years as a trial lawyer also made him wary of executing an innocent person. "If we're going to put someone to death, we must, in my opinion, have a much more perfect system," Brunson said. Kansas Republican Party members stand at ease while votes are tallied at the state convention. Locke’s amendment failed 75-90 on a secret ballot after a voice vote was too close to call, leaving the party platform without any stance on capital punishment. Locke said he would try again at the next convention. Kansas restored the death penalty in 1994, but has not executed anyone since 1965. The state currently has 10 inmates on death row. Dalton Glasscock, the chairman of the Kansas Federation of College Republicans, said momentum is not on Locke’s side. The college Republican leaders have voted unanimously in favor of ending capital punishment in Kansas. Glasscock said he believed Locke’s proposal was a final attempt by death penalty supporters to keep the party from heading in that direction. The Republicans gathered Saturday also voted down a platform amendment that would have defined the judicial branch as lesser than the other two branches of government. But they unanimously approved adding opposition to the illegal sale of fetal tissue to their anti-abortion stance. The 13-point platform that emerged from the convention is otherwise mostly unchanged from years past. It includes strong stances against abortion, in favor of gun rights and in support of the U.S. military and Israel. A “separation of powers” section favors changing the state’s judicial selection method to the federal model in which justices are appointed by the executive branch and confirmed by the Senate or to direct election of judges statewide. Separately Saturday, Republicans approved a resolution urging Kansans to vote against the retention of four members of the state Supreme Court that the party has deemed too liberal, including Chief Justice Lawton Nuss. The platform provides a roadmap for candidates interested in securing the party’s support before the primary election in August and the general election in November, but is not binding. Republicans hold overwhelming majorities with 97 House seats and 32 Senate seats. Lt. Gov. Jeff Colyer said he expects some “fun” primaries in which differences between Republican candidates will be scrutinized. One convention-goer from the state’s 3rd Congressional District asked why the party bothers to form a platform when its candidates don’t run on it. At that, Sen. Tom Arpke, a Republican from Salina, leapt to his feet. 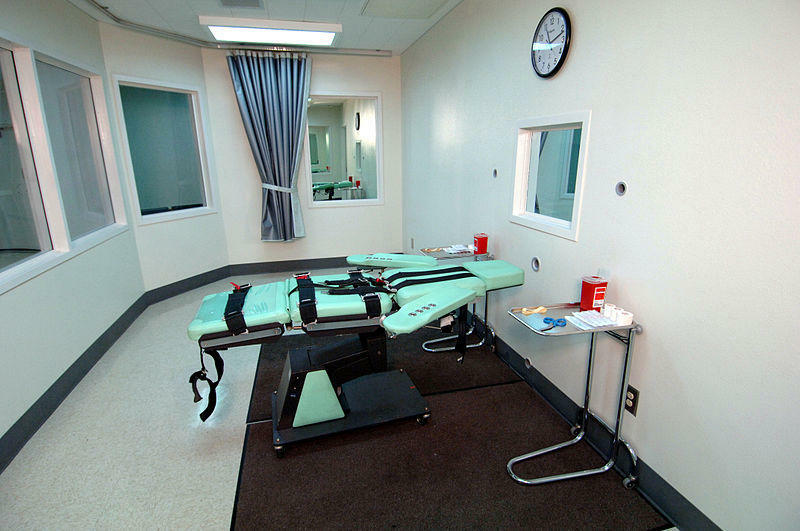 If you thought Texas held the title of death penalty capital, you’d be right — kind of. Though Texas has carried out more executions than any other state, Missouri now has the highest death penalty rate per capita.